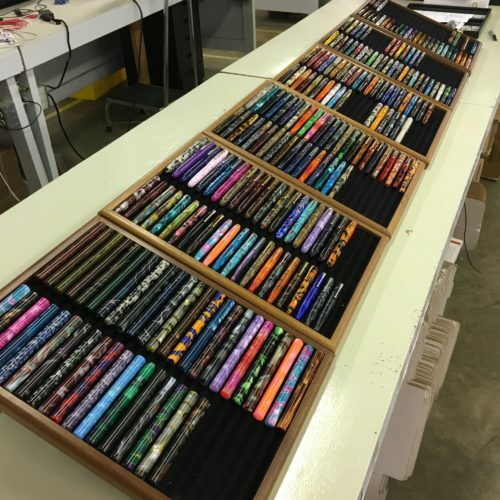 Edison Pen Co – DC Pen Show! We are packed up and heading to DC for the Pen Show! We’ll be bringing around 225 pens with us. This is not as much as we’d like to bring to a show like this, but considering our recent machine issues and delays, it’s not too shabby! Here’s a quick view of what our inventory will look like. There will be plenty of Draw Fillers as well as some pretty amazing materials that we haven’t used before! We’ll be set up from Friday morning until Sunday evening. If you can’t make the show, I’ll be doing my best to keep updates on our Instagram, Facebook and Twitter accounts. Wow! Wish I could be there! Those are some good looking pens, and I’m sure the will be popular! Good Luck! Those draw-fillers are very cool! Glad to see so much innovation in the filling system space at Edison Pens.